Having enjoyed some of Daphne du Maurier’s other short story collections – The Birds and Other Stories, The Rendezvous and Other Stories and Don’t Look Now and Other Stories – I’ve been looking forward to reading this one. Originally published in 1959 and written at a time when du Maurier herself said she had been close to a nervous breakdown, the eight stories in this collection are particularly dark and unsettling. There comes a moment in the life of every individual when reality must be faced. When this happens, it is as though a link between emotion and reason is stretched to the limit of endurance, and sometimes snaps. In this collection of stories, men, women, children and a nation are brought to the breaking-point. Whether the link survives or snaps, the reader must judge for himself. I enjoyed this book, but I found the first three stories by far the strongest and some of the others slightly disappointing in comparison. For this reason, I preferred The Birds and Don’t Look Now, which I felt were more even in quality. Anyway, the first story in the book, The Alibi, gets the collection off to a great start. A man, bored with his life, his marriage and his daily routine, makes an impulsive decision to rent a room in a house chosen at random. Adopting a new identity, soon he is spending every spare moment at the house, but what is his real motive for doing this? This is a creepy and disturbing story; the suspense builds and builds as we wait to see whether it will end in the way we hope it won’t! The Blue Lenses is a very strange story about Marda West, a woman who has been having eye surgery. When her bandages are removed and she is fitted with a new pair of lenses, she finds that the people around her look very unusual – in fact, you could say that she is finally seeing them for what they really are. I can’t say much more without completely spoiling the story, but Marda’s situation is both frightening and fascinating. I loved this story and thought the twist at the end was perfect. The next one, Ganymede, reminded me of Death in Venice by Thomas Mann, both in setting and in plot. A man is visiting Venice for a relaxing October break when a young man working in a restaurant catches his eye. As the days go by, he becomes more and more obsessed with the young waiter, whom he thinks of as ‘Ganymede’. This is another very suspenseful story, as it quickly becomes obvious that things are not going to go smoothly for our narrator – and in du Maurier’s hands, Venice becomes an eerie and sinister setting where we know some sort of tragedy is going to happen. In the next story, The Pool, we meet Deborah and Roger, two children staying at their grandparents’ house for the summer. One day Deborah escapes from her younger brother and enters the woods nearby, where she discovers a pool which seems to lead into a secret world. I didn’t like this story as much as the first three – although, as always, du Maurier’s descriptions are beautiful and vivid. The Archduchess, which follows, is an account of a revolution in a fictional European country called Ronda. This was the only story in the collection that actually bored me – there seemed to be a huge amount of world-building and scene-setting, with very little plot or depth of character – but it’s possible that I didn’t fully understand what she was trying to say. I wasn’t sure what to make of The Menace either. It seemed like a science fiction story at first, about a new filming technology known as ‘feelies’ where actors are wired up to a machine powered by their own life-force. This aspect of the story is never really explained, but I did enjoy getting to know actor Barry Jeans as we follow him through a twenty-four-hour period and I loved the ending. The Chamois is another of the weaker stories in the collection, but still an interesting one. A woman travels to Greece with her husband so that he can hunt chamois, but as they climb further into the mountains, the cracks in their marriage start to show and the woman’s deepest fears become exposed. Finally, The Lordly Ones is a great story to finish with. Ben is a young mute boy who feels neglected and unloved by his parents. When the family move to a new house in the countryside, he escapes to the moors one night and for the first time in his life feels welcomed and cared for by another family he thinks of as The Lordly Ones. This is a very short story with a clever twist at the end that made me want to go back to the beginning and read it again! 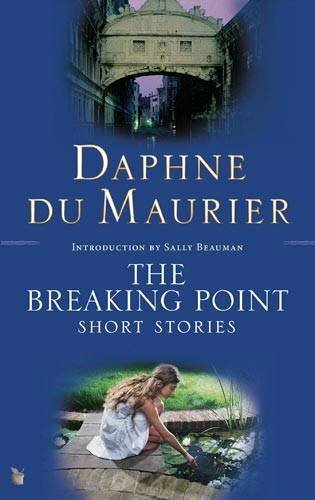 Overall, I do recommend The Breaking Point but if you’re new to du Maurier’s short stories, I would suggest reading The Birds or Don’t Look Now collections first as I thought they were stronger. I still have The Doll, her collection of ‘lost’ stories to read, and will try to get to that book soon. I could swear I read this collection long ago, but none of these stories sound familiar except The Blue Lens! I wonder if I’ve been assuming I’ve read it for years. Maybe The Blue Lenses has appeared in more than one collection. I’m not sure. It was definitely the most memorable story in this book, though. Yes, but the title of the book was what made me think I had read it. I really loved Don’t Look Now and I have The Birds and other stories tbr. These sound really good too though. A collection I hadn’t heard of before. The Birds and Other Stories is probably my favourite of the du Maurier collections I’ve read. I hope you enjoy it! She is one of my favourite authors. I prefer her full-length novels but the short stories are great too! I think I’ve read The Chamois in some anthology or other but haven’t come across the rest of these. I’m intrigued that one or two of them felt like sci-fi to you – I just read her The Break-through, which is real sci-fi in the mad scientist tradition, and that was the first time I’d thought of her as dabbling in that genre. Yes, I read The Breakthrough last year and it’s definitely not what most people would expect from du Maurier! I don’t think she wrote anything else with such strong sci-fi elements, though (apart from the time travel in The House on the Strand). Someday soon I will be through all of her novels and being bereft I will have to turn to her short stories. The breaking point idea sounds attractive to me. I’m not really a fan of short stories, but I do enjoy du Maurier’s! I will be reading Jamaica Inn and Rebecca this year, if time permits. I want to read her body of work by order of publication and availability from my TBR. I have a few du Maurier’s in mount TBR, so hopefully I’ll be able to read a few before I buy again. Rebecca has been one of my favourite books since I first read it as a teenager, so I hope you enjoy it too. I do like Jamaica Inn, although it’s a weaker book in comparison. The gothic atmosphere she creates in both novels is wonderful. Helen, as you know, I have enjoyed du Maurier’s The Birds and The Doll short story collections – I hope you will enjoy The Doll collection as much as I did. There are some really creepy ones in there! I would like to read The Breaking Point at some point, but I think it sounds like I should focus on getting my hands on a copy of Don’t Look Now first. The Doll sounds great! I’m expecting to enjoy it as I’ve enjoyed all of her other short story collections. The Birds and Don’t Look Now are my favourites.